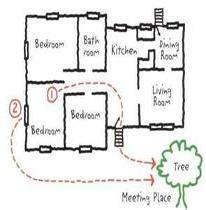 Each family member must know what to do in the event of a fire in their home. Always call 911unless a small fire can be easily controlled, it is recommended that fighting the fire be left to the Fire Department and that family members escape safely from the home. Simply creating home escape plan is not enough. It must be practiced so that each person knows exactly what to do. It also is important to practice Exit Drills In The Home (EDITH). Most residential fires occur between 10 PM and 6 AM. Deaths from residential fires occur in greater numbers between midnight and 4 a.m. when most people are asleep. An average of 800 fires strike residential buildings each day in the United States. In 2007 U.S. Fire Departments responded to an estimated 399,000 home fires. More than 3,000 persons die each year from residential fires; more than half of them children and senior citizens. On average, in 2007 eight people died in home fires. Bedroom doors should be closed while people are sleeping. It takes fire 10 to 15 minutes to burn through a wooden door. That’s 10 to 15 minutes more for the inhabitant to escape. In Phoenix, a family of four was trapped inside their home and couldn’t get out because security bars were bolted on the windows. If a family feels they need the additional security, “fire safe bars” should be installed or retrofitted. An exit should not require special tools. A key is considered a special tool. The Phoenix Fire Department advises that bars on windows should have a single action quick release device. Special provisions may be required for infants, young children, disabled, or the elderly who may need additional help when escaping. These provisions should be included in the home fire escape plan and discussed with family members. Look for these important features in the building – enclosed exit stairways, clearly-marked exits, clean hallways and lobbies, automatic sprinklers, fire alarm systems and smoke detectors.